U.S and partner nation service members participating in Pacific Partnership 2018 arrived in Trincomalee, Sri Lanka, aboard the U.S. Navy hospital ship, April 25. 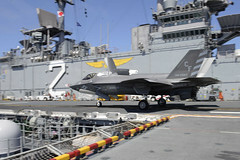 Essex Amphibious Ready Group and 13th Marine Expeditionary Unit commenced an ARG/MEU exercise off the coast of California, April 24. This year, our allies West are marking an especially poignant ANZAC Day. 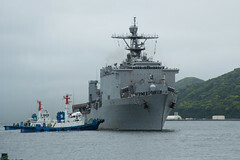 The forward-deployed amphibious dock landing ship returned to Sasebo, Japan, April 24, after a patrol with the Wasp Expeditionary Strike Group. 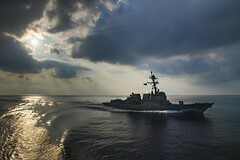 The five-day anti-submarine and maritime domain awareness exercise kicks off in the Andaman Sea, April 25. 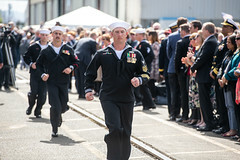 The Navy's 11th San Antonio-class amphibious transport dock ship was commissioned in Portland, Ore., April 21. The guided-missile destroyer departed San Diego, April 20, officially beginning its transition to the Forward Deployed Naval Forces in Japan. 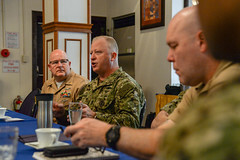 The U.S. Pacific Fleet Master Chief led command master chiefs from units across U.S. 7th Fleet in the first overseas MCPON Executive Leadership Symposium, April 18-20. USNS Brunswick (T-EPF 6) arrived in Tawau, Malaysia, April 21, for the embarked team's third Pacific Partnership 2018 mission stop. 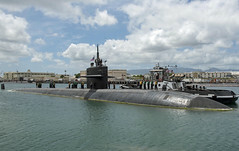 The Los Angeles-class fast-attack submarine departed Pearl Harbor, April 20, bound for Bremerton, Wash., to begin the inactivation and decommissioning process.